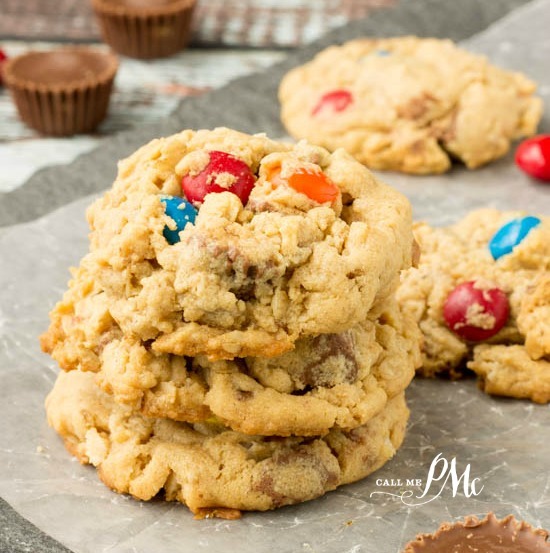 Loaded Butterfinger Chocolate Chip Toffee Cookies are completely full of candy bars and chocolate goodness. 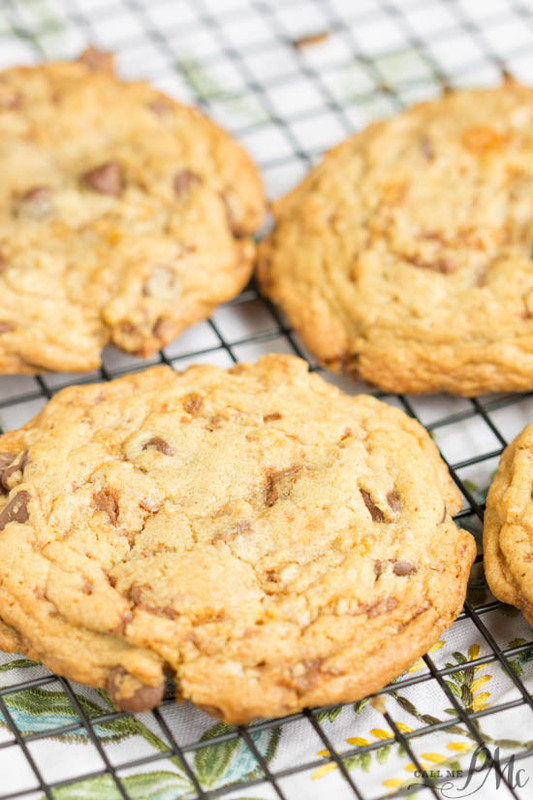 I actually made these Loaded Butterfinger Chocolate Chip Toffee Cookies on a whim with no intention of blogging them. I promised the boys we’d make cookies to help their moods. They just went back to school. I posted a photo on Facebook and all my friends left such sweet comments wanting the recipe, I decided to share them with you. 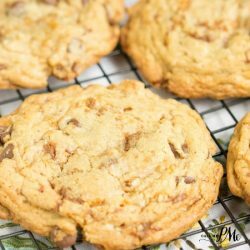 I took my favorite cookie recipe and filled it full of extras including chocolate chips, toffee chips, and crushed Butterfinger candy bars. Coincidentally, the three candies have similar tastes and textures and each compliment the other. Try mixing in Snickers bars or Twix bars. 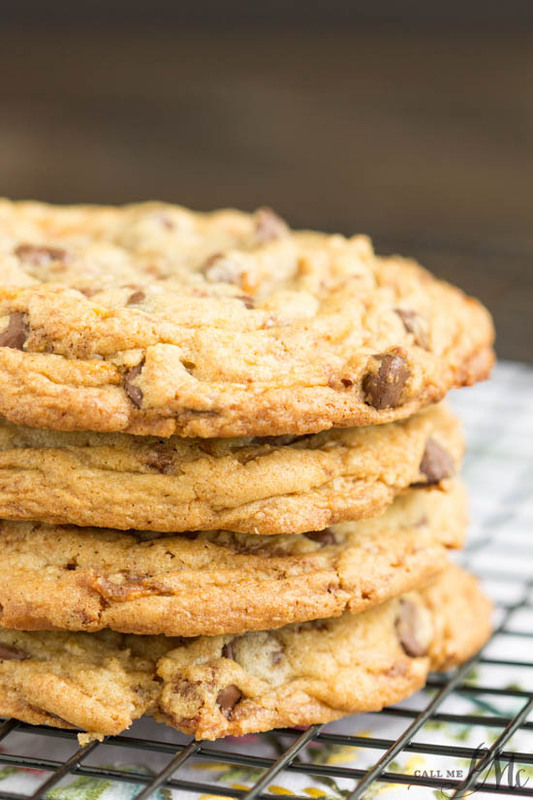 I love this base cookie recipe. 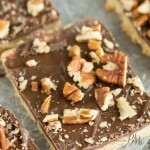 It’s easy and adaptable to any chip or candy bar you want to mix in. Most noteworthy, I’m very particular about cookies. 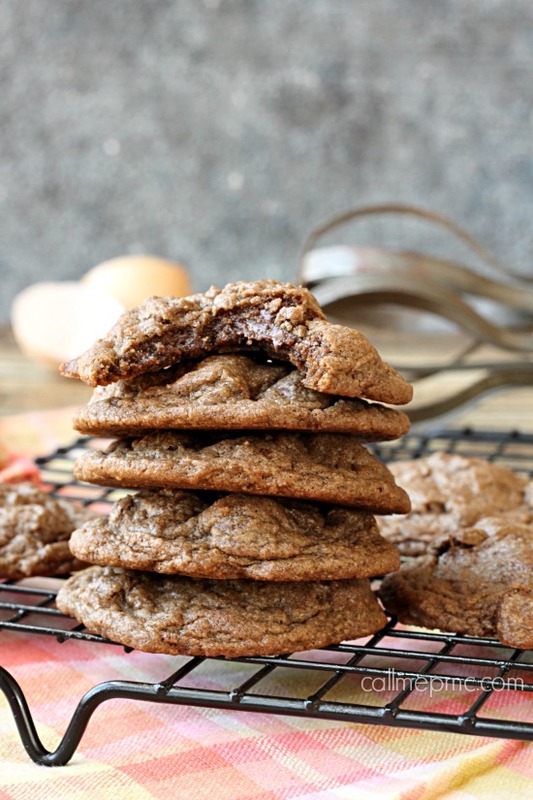 I like large cookies that are cooked to the point that the edges are crispy but the thick centers are soft and gooey. Therefore, the size and cooking time or specifically geared toward this. By all means, if you like crispy cookies, or small cookies, or not-crunchy-at-all cookies, alter the size and adjust the cooking time. 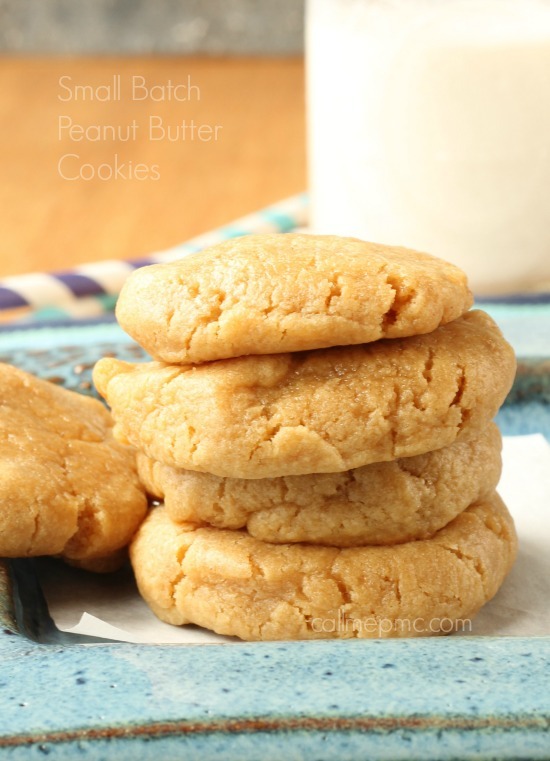 Whether you like your cookies thick, thin, crispy, or gooey, these are good any way you look at it. 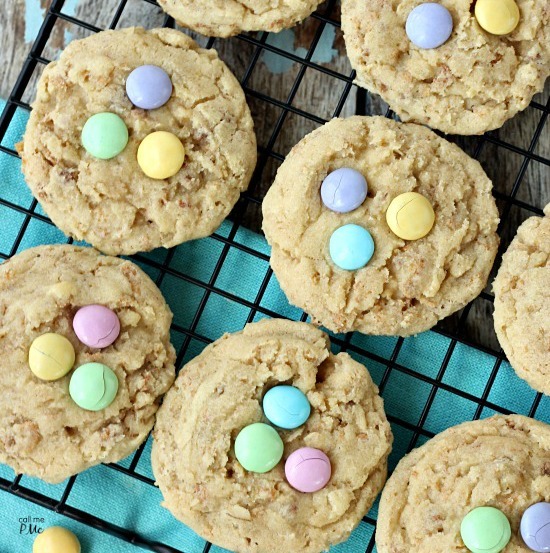 I want to give you a few tips so your cookies turn out beautiful and most of all tasty, just like these. Use real butter. I used salted butter. Unsalted is fine as well. Use old-fashioned rolled oats. You will need to process them in a blender or food processor 5 or 6 pulses. They do not have to be processed to flour consistency; they can have some larger oat pieces in them. Use a silicon mat. I use a Silpat brand. 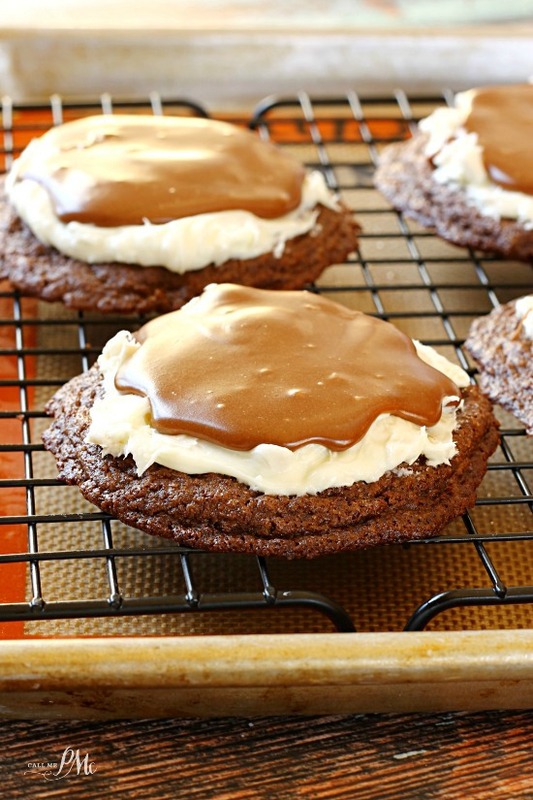 Besides being easier to clean up, using a silicone baking mat allows the cookie to ‘grab’ onto something as it cooks. As a result, it will cook ‘up’ instead of ‘out’. 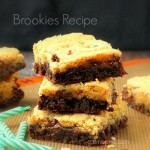 This aids in making a thicker, softer cookie which I like. Use a quick-release scoop (an ice cream scoop) to get all your cookies the same size. Not only will they look more professional, they’ll cook more evenly. Cool your cookie sheet between cooking each batch. A hot sheet makes the dough begin to melt before getting into the oven, which makes them bake unevenly. They’ll tend to have thin crisp edges and thick, undercooked centers. Prep time does not include refrigeration time. 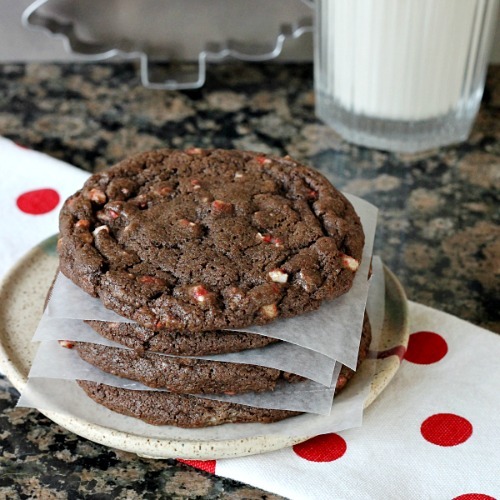 Allow at least an hour for the cookies to chill in the refrigerator or freezer. 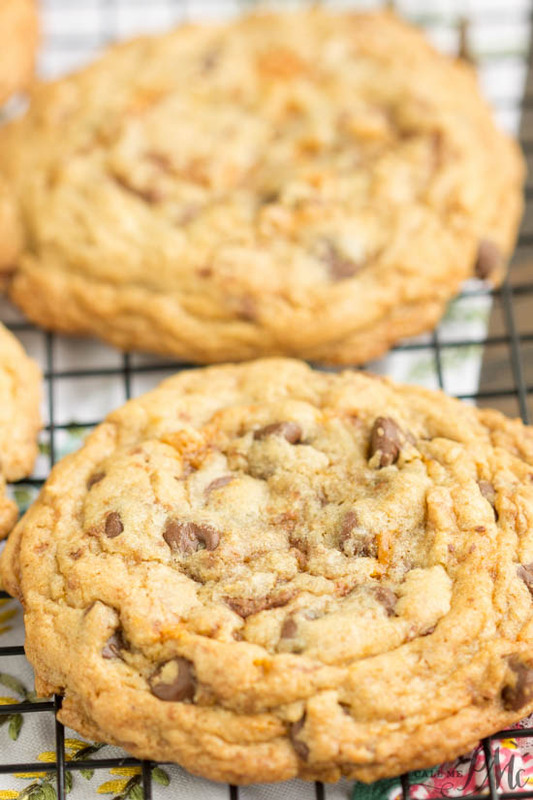 Loaded Butterfinger Chocolate Chip Toffee Cookies are full of chocolate mix-ins. 2 cup chocolate chips I used semi-sweet. Use your favorite. Cream butter and sugars until smooth. Add eggs and vanilla, beating until smooth. Combine flour, baking soda, baking powder, and salt. Slowly add to mixer and mix until combined. Don't over-mix. Combine remaining ingredients in a large bowl: oats, toffee chips, candy bars, chocolate chips. With the mixer on low, add these ingredients until just combined. Don't over-mix. Using a spring release scoop (like an ice cream scoop), scoop dough onto a cookie sheet that is lined with parchment paper or waxed paper. Place in the refrigerator or freezer for at least one hour. You can store the dough in the freezer up to four months. 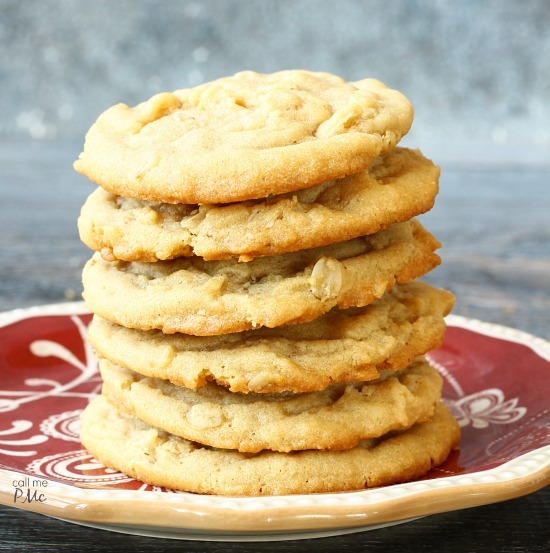 To bake: Preheat oven to 375 degrees F. Remove cookie dough from freezer (just the quantity you intend to bake.) Allow to sit out 15 minutes before baking. I used a 1 and ½ inch scoop for my cookies. At this size for a cookie with crisp edges and soft in the center, I bake for 9 minutes. Watch them closely to get the perfect doneness for you. Allow cookies to sit on cookie sheet untouched 3 to 4 minutes after removing from oven. After 3 to 4 minutes, using a thin spatula, remove cookies from cookie sheet to a wire rack to cool completely. Store in an airtight container up to 4 days. Recipe from Paula @CallMePMc.com All images and content are copyright protected. Please do not use my images without prior permission that includes copying the ingredient list or entire recipe and posting in the comments on Pinterest for Facebook. 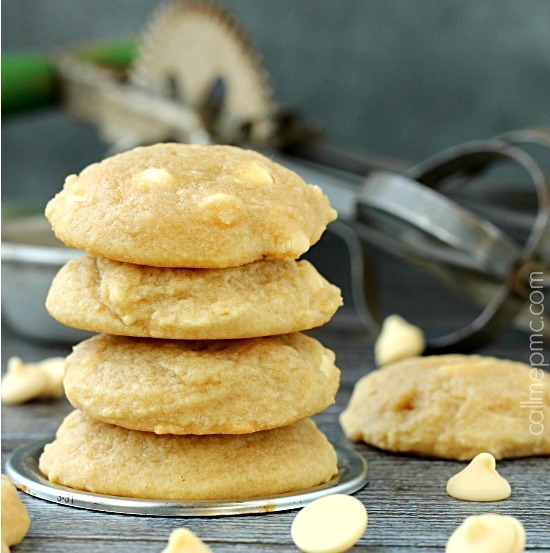 If you want to share this recipe, please simply link back to this post for the recipe.I used a 2 tablespoon quick release scoop for these cookies. I baked them at 350 degrees for 9 minutes. Cool cookies on the pan for 3 to 4 minutes before transferring to a wire rack to cool completely. The cookies will firm up as they cool. Store baked cookies in an airtight container! Don’t you put reviews after your recipes? I always like to try recipes but first see what others have to say. Like your butter finger, toffee and choc chips cookie.